Oscar Pistorius believes Britain’s Jonnie Peacock is ready to inherit his title as the king of Paralympic sprinting after his stunning victory in the battle of the blades. Pistorius was full of praise for his T44 100m rival after Peacock blew away a high-class field to take gold at the Olympic Stadium in a new Paralympic record of 10.90 seconds. “Jonnie’s a great athlete. 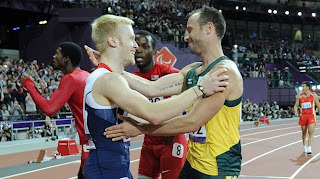 I enjoyed racing against him tonight,” said Pistorius, who was edged out of the medals by American Richard Browne and his fellow South African Arnu Fourie. “He was inspiring. He really epitomises the profession. I think what people witnessed here is the beginning of a phenomenal career for him. Peacock emerged from his medal ceremony with three gold medals around his neck after receiving two golden paper plates from overjoyed fans in a pulsating Olympic Stadium. “I can’t think of words to describe it,” the 19-year-old told C4Paralympics. “When I broke the world record in Indianapolis I expected three or four people who knew about it to thank me on Twitter and I got hundreds and hundreds of emails to say well done. Peacock had his right leg amputated below the knee at the age of five after contracting meningitis. He was still learning how to run on a blade in 2010 and has improved his best time by almost 1.5 seconds under the direction of coach Dan Pfaff, who also trains Olympic long jump champion Greg Rutherford. Peacock’s was one of six GB golds on ‘Thriller Thursday’, taking ParalympicsGB on to 108 medals - and surpassing their target of 103 with three days still to go at London 2012. “For the past four days I’ve been in the village trying to keep focus,” said Peacock, who revealed that he intended to celebrate by “going out a lot”. “But when you’ve got guys like David Weir going out and getting golds you just want to go out and be a part of that.